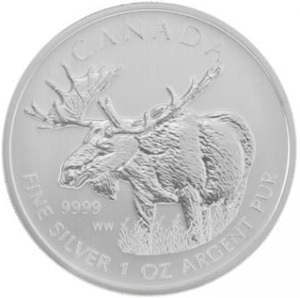 Today at the World Money Fair in Berlin, the Royal Canadian Mint officially launched the 2012 “Moose” Silver Bullion Coin. This represents the fourth in series of six coins depicting different species of Canadian wildlife. The reverse design of the latest release features the depiction of a majestic moose by Senior Mint Engraver William Woodruff. The moose is Canada’s largest land mammal and rules the forests from Newfoundland to the Pacific Coast. Inscriptions include “Canada”, “Fine Silver 1 oz Argent Pur”, and “9999”. The obverse design of the coin features the effigy of Queen Elizabeth II designed by portrait artist Susanna Blunt. The 99.99% pure one ounce silver bullion coins carry a face value of $5. The Royal Canadian Mint’s Ottawa facility will produce up to one million “Moose” silver bullion coins, which will soon be available through the Mint’s network of bullion distributors. Previous releases of the series have featured the timber wolf (2011), grizzly (2011), and cougar (2012). Two additional designs for the series will be released by early 2013. Image provided courtesy of the Royal Canadian Mint. Huh. I don’t like how the design is cut off to make room for the words this time around. I liked it when they had the words over the background design. So, exactly where can one go to find the official ‘released’ mintage numbers on Canadian coins? I’ve not been abele to find that info and have searced far and wide. I have Wolves and Cougars, but no way of knowing if they struck 1 million of each or ten thousand. Someone somewhere must have the exact number struck.